← Congrats Coach Kidd! Pierce Didn’t Foul Out! Nets-Raptors Game 3: 5 for 5! Nets fans: As you all know, the Nets do not have home court advantage in their series against the Toronto Raptors. So on the one hand, it is great news that they came out of Toronto with a split. On the other hand, the Nets lost game 2 with a potential chance to take a commanding 2-0 lead, so the onus is now on them to command home court, or risk having to win in Toronto once again. Wondering what to look out for this weekend? Here’s the Brooklynsbeat staff hot on the trail! 1: What is the key to the Nets winning games 3 and 4? Justin Salkin (@brooklynsbeat): Knocking down shots. The Nets are shooting 23% from 3 as a team in the playoffs, with Deron Williams the only player over 30%. The Nets got a road split, which as the road team is your job over games 1-2, and did it without hitting shots: the defensive effort and intensity is there for the most part. I have no doubt the Nets will be ready to fight in games 3-4. If they begin hitting their threes, that would be an excellent sign in their second goal: taking both games at home to take control of the series. Anthony Pignatti (apignatti360): The key to winning games 3 and 4 for the Nets is to keep the Raptors out of transition. This Raptors team is quick and can really put up points in transition when you have the likes of Kyle Lowry, Demar DeRozan, and Terrance Ross running the floor in space. The Nets’ half-court defense is stout, but if the Nets continue to miss from long range which then turn into long rebounds, look out. The Nets have played very poorly in Game 2 and still came THIS close to taking a 2-0 series lead with a chance to close out at home. The Nets are executing their offensive sets well. Quality looks have come possession after possession, but the shots just haven’t fallen yet. I say “yet” because as long as the Nets continue to run their sets and find themselves open for shots, the Law of Averages says that these shots will begin to drop. The Nets are currently shooting an abysmal 23% (11/48) from deep, a number that is just not sustainable for an NBA team that set a franchise record in made threes this season. Once this team starts hitting from 3pt range, the Raptors’ transition opportunities become scarce. Jake Henson (jwhenson_): Exploiting the Raptors lineup deficiencies. Whether that be posting up our guards on the likes of DeRozan, Ross and Lowry or crowding the paint when they play Amir Johnson instead of Patterson. I’d also like to see Garnett try and draw Jonas deep and make him scramble in pick and rolls to keep him off the glass. It’s a chance for Coach Kidd to really showcase his talent by picking apart Dwayne Casey’s lineups. Jordan Patton (@jordanpatton22): I don’t know that there necessarily is a new key for the Nets heading into games 3 and 4. I think the most important thing for them to do is to stick to their game plan from the first two games of this series. The Nets shot a pretty below average (putting it nicely) percentage from beyond the 3-point line in the first two games, yet they walked away from Toronto with a win and came one spectacular quarter from Demar Derozan short of winning two. If the Nets execute and hit the open shots that they missed in games 1 and 2, they should have no problem taking care of home court. Dylan Mendelowicz (dylanM_NBA): Defending the paint and controlling the boards are definitely the keys to winning these two very important games. Jonas Valanciunas has absolutely dominated the Nets inside and we simply have had no answer. It’s important for Brooklyn to get creative and find ways to get the ball out of Val’s hands and away from the paint. Let the Raptors beat you on jump shots, and if they do, they earned it. Rebounding has also been an absolute mess for Brooklyn thus far, the simple lack of size doing most of the damage. We obviously lack size, but maybe getting Blatche a bit more playing time (the only one who can match Val/Toronto’s bigs physically) could help. Whatever it is, the Nets need to get better inside. 2: What is your biggest concern heading into games 3 and 4? Justin: Kyle Lowry, still. Lowry is the one player on Toronto that can truly gash us, in a way I still believe DeRozan can’t, if he gets hot. The Nets have yet to deal with one of Lowry’s hot streaks in this series, and Lowry seems to thrive off being the villain. If he gets hot at Barclays, the Nets will be in for a serious battle. Anthony: My biggest concern moving forward is the Nets’ lack of rebounding. You’re probably thinking, “yeah but this team has been getting out-rebounded and still finds ways to win.” I understand this team has been consistently out-rebounded through the better part of the season. But they have been completely destroyed on the glass. After just two games in Toronto, the Raptors have out-rebounded the Nets 97-67. For our non-math majors reading, that’s 30 rebounds in TWO games. Yikes. It’s one thing to keep the Raptors out of transition. It’s one thing to continue to turn the Raptors over. But if the Nets aren’t closing out possessions with defensive rebounds, extra opportunities for the Raptors could end up costing Brooklyn a game in this series. Jake: The rotation. Kidd doesn’t seem to be set on who he wants to play. Mirza seems to be the go to backup 4 to Pierce, which I like. Kirilenko, Blatche and Thornton are essentially fighting for 2 spots and Kidd doesn’t want to play Plumlee and Blatche together. Jordan: I don’t have any particularly big concerns heading into this weekend. I’m hoping that the Nets start out game 3 strong and bring the Raptors back to earth after their game 2 win. If Brooklyn comes out flat and Toronto comes out riding high after their game 2 win, it could prove problematic. Dylan: Jason Kidd’s rotations have certainly made me a bit antsy to start the series, and I’ve gotten increasingly concerned with how minutes and rotations will be handled in the coming games. Andrei Kirilenko proved in game two he absolutely needs to be on the floor, and Mirza finally stepped up. But I’m not sure I fully trust Kidd to get the right guys enough minutes and get the starters on the floor down the stretch when needed. 3: Jason Kidd says that he will not waver on Kevin Garnett’s minutes, even though we all do not like that. Should we be worried. Justin: I know I have long said that everyone is overreacting to Kidd’s minutes management (you can’t expect 35-40 minutes from older guys a whole season), but there is concern here. Unless Plumlee starts playing like the guy from March and April, or Blatche provides more consistency, KG is by far the Nets’ best big: the Nets are +17 with him on the floor and -15 with him off this series, and those numbers aren’t misleading (sometimes +/- can be): he is able to at least mitigate the damage Valanciunas doles out. The way the series is going, the Nets do not need to win the rebounding battle, but while they can lose it, they can’t get destroyed in it. KG playing 25-28 minutes would be a huge boost. Anthony: Like most of us, I’m puzzled at the notion of keeping Garnett’s minutes restricted throughout the playoffs. He has played about 18-20 mpg throughout the season, a number most of us figured was to preserve Garnett for the postseason. He’s exceptional at communicating on defense, defending the pick and roll, and his defensive rebounding is highly coveted on this Nets team. All of this begs the question: why isn’t Garnett seeing more time on the floor? Is Kidd being extraordinarily cautious with KG’s recent back spasms that caused him to miss 19 straight games? Does KG have an injury that the team is keeping to themselves? 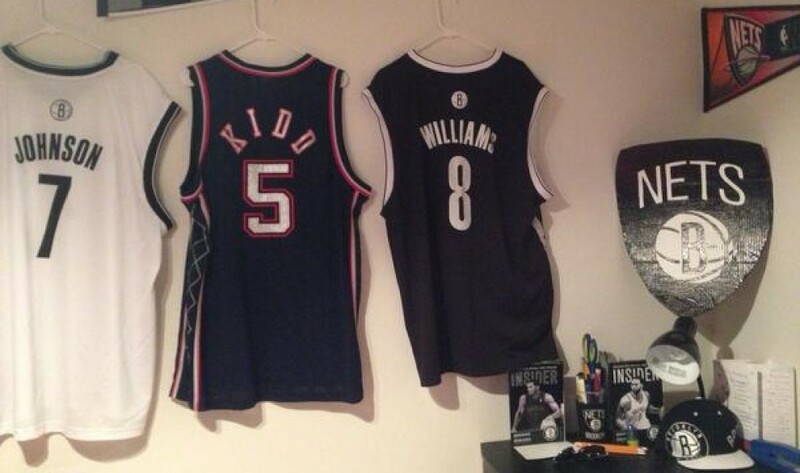 Does Kidd plan to increase his minutes if the Nets advance deeper into the playoffs? I’ve struggled to make sense of this one Nets fans. I’m hoping Kidd has a method to his madness. Jake: I’d love an extra 5 minutes out of him, but I’m not worried because I think we all expected this to happen. Plumlee looks okay out there but the likes of Kirilenko, Johnson, Livingston and Pierce will have to do some dirty work to limit how much we get killed on the glass. Jordan: I don’t think we should have any cause for concern to be honest. We can disagree and be upset with some of his decisions but I think that at the end of the day, coach Kidd has done a pretty solid job with his rotations this year. I think after all of the rest he got during the final month or so of the season that KG should be fresh enough to play at least 25 mpg in the playoffs, but hey, that’s why I’m not the coach I guess. Dylan: A little bit, but not too much. KG should definitely get a bit more playing time, he could definitely handle 25 minutes with at least a day off in between every game. However, this is the way the Nets have played for more than half the season. Plumlee, while looking like a bit of a rookie, being overmatched at times, has overall played well and not been phased by the playoff intensity. Between him and Andray Blatche, they’ve done a very good job throughout the year playing the majority of minutes at the center position when KG is out. That hasn’t changed and I don’t see any reason it will change for the rest of the playoffs. 4: Who is the Nets’ X Factor heading into games 3-4. Justin: I hate to go there, but I will pick Deron Williams. If he outplays Lowry, which he did in game 1 but not in game 2, he simply makes everyone better, elevates the team, and solves many of the Nets’ problems involving rebounding, and relying on others to hit their triples. Literally, all the Nets did in game 1 was get a star level Deron, and couple that with Joe controlling his matchups with smaller defenders (totally foreseeable) and an aggressive defense: that got them a road win over a 48-34 team without hitting shots. Star level Deron will go a LONG way towards potentially winning this series. Anthony: The Nets’ x-factor for games 3, 4, and beyond? Am I allowed to say the entire bench? Mirza and Marcus Thornton are virtually useless if they aren’t hitting their jumpers. Both players are very capable scorers, but their defensive deficiencies make it difficult to give Kidd a reason to keep either player on the floor for extended minutes. One of these two players needs to add some scoring off the bench in both games 3 and 4 if the Nets want to take a commanding 3-1 advantage in the series. Plumlee has been fantastic in his limited role for the Nets ever since he cracked the starting lineup from Garnett’s absence and subsequently became Garnett’s backup once he returned from injury. If Mason can stay out of foul trouble, Kidd can keep Blatche on the bench because frankly, his defense is terrible. With that said, I can see a game in which Blatche is inserted for some spot minutes and goes “Full Blatcheness” on us; the good kind. This team is regarded as one of the deepest teams in the league. It hasn’t showed…..yet. Jake: Teletovic has a 6-8 from 3pt land game up his sleeve I think. He doesn’t look flustered by the big moment and believes in his shot. Kirilenko showed glimpses in Game 2 of being a difference maker. I’d love a throwback twenty five minute performance of 8 points, 8 rebounds, 5 assists, 3 steals , 2 blocks game from him. Jordan: The popular answers to this question are typically Thornton and Teletovic, however, I don’t think it is either of them. My answer might sound a little bit crazy but I think the X Factor this weekend will be Mason Plumlee. I know Plumlee isn’t really seen as a game-changer but I think he is going to be huge in these next two games for two reasons. The Nets have been out-rebounded terribly in this season and I’m sure his teammates and coaching staff have made sure that he knows this fact – look for him to step up and play a big role on the boards. The second reason I see him as an X Factor is his verticality. If Plumlee gets loose on a couple fast breaks and throws down a couple alley oops – the Brooklyn crowd will feed off his energy and pump it back into the players on the court. Dylan: The X-Factor this weekend for me personally would be Mirza Teletovic. He stepped up in game two, hitting some big shots when needed, and I believe he can continue doing so. Mirza has proven he’s a big game player, as evident in many of the Miami-Brooklyn classic battles. If Mirza can come in to both games, knock down some threes and play with a bunch of energy, it could go a LONG way in getting two victories this weekend at Barclays. Justin: I am confident in this team. I am always talking about how in the playoffs, you must guard to win and must play with intensity and passion. The Nets have shown us that passion. They’re fighting, they’re aggressive, they’re talking trash, and they’re fully locked in. I really believe they can open this series up if they hit shots, and they have earned the opportunity to take command by swiping away home court. I am hopeful and confident they will win both games this weekend and take a 3-1 edge. Anthony: I’ll be as objective as possible when I say this, but I fully expect the Nets (28-13 at home this season) to win both Game 3 and Game 4 this weekend. It comes down to execution, and I find it hard to believe the Nets will continue to shoot 43% from the field. I look forward to seeing some defensive adjustments from the Raptors side on how to play Joe Johnson. He’s had his way for two straight games now. If they decide to hard-double him on the block, JJ has to be quick to find his teammates for open looks and driving lanes to the basket. Look for the Raptors to be more decisive on defense. It’s going to depend on our in-game adjustments and execution in order to successfully counter their defensive adjustments. Also, with DeRozan going off for 30 in Game 2, look for the Nets to show him a bunch of different looks to try to keep him in check. Jake: That the Nets will win AT LEAST 2 games at home. I’d be very disappointed and surprised if the Raptors win the series. Jordan: I think the young and inexperienced Raptors will be overwhelmed by what should be an incredibly hostile Brooklyn crowd and the Nets will take advantage. As KG said, I don’t know if you can say “F*** Brooklyn” and then come into Brooklyn. Nets win games 3 and 4. Dylan: The veteran Nets want this, and know this is the time to get it done. Masai Ujiri and the Toronto Sun continue to disrespect and throw jabs at them, and I’m positive they’re going to respond in a big way. I see the Nets taking both games this weekend and putting Toronto on the brink as they had back above the border. It should be a great weekend of playoff basketball in Brooklyn. Go Nets! This entry was posted in Previews and Recaps. Bookmark the permalink.